Here's the Menu from Final Fantasy 3. I consider this to be pretty close to being the template for how menus should be layed out. As you'll note, the main window occupies about 80% of the screen area-- with secondary windows kept at the edges as opposed to popping up over the main window. Now, admittedly, this is EXTREMELY utilitarian and doesn't actually look all that nice. But I post this as an example of a basic, easy to use menu layout. The grey rectangle marked 1-- This is your primary window. No matter whether it's displaying your party, your inventory, a bestiary entry, or what have you. 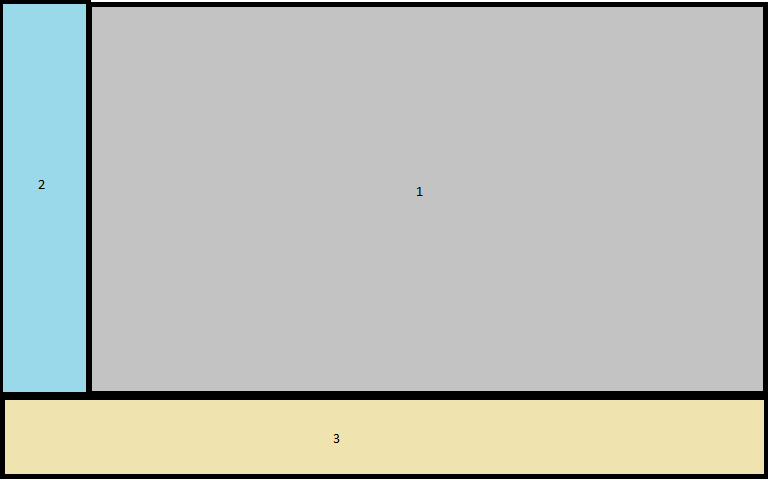 The beige rectangle marked 3-- This will usually be a secondary display. Information such as item descriptions, number of the selected enemy type encountered, and any info you don't want displaying alongside whatever is currently in the primary window should go here. Now I should note there is a fourth window that you may want to implement under this basic set up, namely one that DOES violate the basic rule about windows not popping up over the primary window. This pop up window should almost exclusively be used for player confirmation of changes or at least notification of changes. Well, that's all I have for right now. I'll also note that this diatribe exclusively applies to gamepad style setups. I might add more later on menu systems for different input methods at a later date, but for now I'll be focusing on menus for this input method.